With the supply of silver blanks strained, quantities of 2014-dated American Silver Eagles from the U.S. Mint will remain limited as sales of the bullion coins kick off today, Jan. 13, 2014. Blanks are the round metal discs needed to make the 99.9% pure silver coins. The bureau this year will continue its allocation program which limits how many Silver Eagles its authorized dealers can buy, estimating about 3.5 million will be available for allocation this week and noting "allocated quantities for the following week will be much lower." Coin News Update: Later on Monday, the U.S. Mint provided the opening day sales total for the 2014 Silver Eagle and it also specified the exact weekly allocation amount. It said first-day sales reached 3,180,500 coins from the weekly allocation of 3,575,000 coins. On Tuesday, the bureau said another 191,000 coins sold, leaving 203,500 left for the week. The Mint also said it expects next week’s allocation level to be around 500,000 to 600,000 coins as it begins "slowly building weekly inventories." The original 3.5 million amount was provided by the U.S. Mint in a memo sent to its group of buyers and it’s the combined total from both facilities producing American Silver Eagles, the West Point Mint and San Francisco Mint. San Francisco was added as a bullion Silver Eagle maker in 2011 to help satisfy demand that ramped up in 2008 to unprecedented levels and then kept growing. American Silver Eagle sales hit an all-time annual record of 42.675 million in 2013. The United States Mint now has the capability to fulfill demand, but the limited supply of silver blanks has kept allocation alive. The bureau does not manufacture blanks for silver coins like it does for nickels, dimes and quarters. They are purchased from a select group of vendors who are rationing how many they sell. One of those vendors, Sunshine Minting Inc. (SMI), may help free the Mint from its allocation program with the addition of a new production facility in Las Vegas. "At every opportunity, we have tried to give a little more output to the U.S. government as they have asked for it," Tom Power, President and CEO of Sunshine Minting Inc., said in an interview published in the December Silver Institute newsletter. among customers including the U.S. Mint. With our added capacity, we can increase our allocations to all of our customers." Power said they have gone from an output of 1.2 to 1.3 million ounces a week to well over 2 to 2.5 million ounces. Bullion American Silver Eagles are not sold by the U.S. Mint to the public, unlike collector versions that carry mint marks and special finishes. The Mint sells them in bulk to authorized dealers for $2 per coin, plus the market value of the silver in them. These dealers, officially called "Authorized Purchasers," resell the coins in smaller quantities for a modest markup. Today, AP’s placed their orders for new 2014 American Silver Eagles. They can pick them up at the West Point Mint on Thursday, Jan. 16. Orders accepted will be fulfilled randomly with boxes of San Francisco-produced and West Point-produced coins. "Authorized Purchasers will not be allowed to specify San Francisco or West Point-produced coins in their orders. The American Eagle Silver Bullion Coin green outer, recyclable boxes (Green Monster Boxes) will feature the unique ‘banding’ of the facility where the coins were struck," the Mint’s memo stated. Bullion and coin dealers are currently preselling 2014 American Silver Eagles for about $3.50 – $5.50 over silver spot with discounts offered for larger orders and for those paying by cash, check or wire. Generally, American Silver Eagles command a higher premium earlier in the year as investors and collectors jump at getting the new dates. Last year in January, 2013 American Silver Eagle sales reached a monthly record of 7,498,000. The 2013-dated coins debuted on Jan. 7, 2013 with orders of 3,937,000. The Mint had to halt sales temporarily on Jan. 17, 2013 when its stockpiles were depleted. Sales resumed in an allocated basis on Jan. 28, 2013 with rationing in place ever since. The 2013-dated Silver Eagle inventory ran out on Dec. 13, 2013. The month-long dry spell may help in driving January 2014 sales to a new record. Bullion American Silver Eagles have been produced annually by the United States Mint since 1986. The Mint released its 2014-dated gold bullion coins — the American Gold Eagles and the American Gold Buffalo — on Jan. 2, 2014. They have enjoyed strong early sales. “The Mint sells them in bulk to authorized dealers for $2 per coin, plus the market value of silver in them.” What does the Mint receive per coin above gold price for gold bullion from their authorized dealers? CAGCRISP, the Mint sells gold bullion coins to AP’s at premiums of 3% for the one ounce, 5% for the half ounce, 7% for the quarter ounce, and 9% for the tenth ounce. OK so silver is scarce and hard to get, with government mints from around the world competing, along with commercial and industrial buyers. There are insufficient supplies to meet demand. Money is supposedly scarcer today than it was in the 1970’s, yet business interest rates today are less than 1/10 the actual rates they were then. Savings and loans failed in the 80’s under Reagan, and banks had to be propped up to avoid them failing under Bush. Yet banks today are raking in the highest profits in the history of the world, despite most economists stating that the world economic system is a ponzi scheme. So why does the value of silver stay relatively so low? BOZ: That is a great question…. I like what Kahoola pointed out about the fact that nearly 100 years ago, the US Mint by itself cranked out nearly double the amount of the same coins – what is going on with the Mint that they can’t do much more today? THAT, and WHERE are all the coins minted in the last 4 years? Especially the quarters? Seriously! I’ve seen in pocket change and at the bank like a total of 40 quarters max since 2010. The state quarters were ubiquitous – where are all these quarters hiding? Anyone know? Here is the answer to why Silver cost remains low. While there is a squeeze in the current supply of Silver the total amount of Silver in the market remains high. If the price of Silver rises too high, Granny cashes in her scrap Silver spoons and tea set, etc. Their remains all of the Silver mined since the dawn of civilization, a vast amount. As a contrast, all of the Gold mined since the dawn of civilization would only fill 3/4ths of the Washington monument in DC. Could be wrong, but before the industrial revolution there were 100+ billion ounces of silver. This was consumed over the decades, no recycling, 50b, 40b, now about 10-20 boz. Of this maybe 1-2 boz available to the market and dropping as the developing countries consume more silver. So there is more produced than gold but it is also consumed probably faster than it can be produced. There might be loads of silver in the market and a squeeze in current supply. But the law of supply & demand says that if you took your 400 oz bar, melted it down to 1 oz bars and you could sell it at $5-$7 premium over melt it would make economic sense to do it. It seems that there is no big rush to melt down the 400 oz bars. It does not add up. 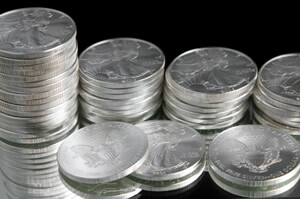 During January and February and even March, we will see whether the public has enough appetite to buy physical silver. If the appetite doesn’t pick up, we might see silver price dip below 19 $ during the warmer months (towards the end of the spring and beginning of the summer). I just heard on a TV coin show that the output of 2104 silver eagles struck at San Francisco may be very limited, or possibly stopped altogether perhaps for good. No one is sure about this, and the numismatic community is awaiting information/confirmation from the U.S. mint. On the surface, given the heavy demand for the eagles, and record output the last 2 or 3 years, that doesn’t seem credible, unless the West Point facility has been expanded to be able to handle the increased demand. So far, the SF mint has produced some limited production of eagles, So my question is—-does anyone know definitively if this is true, and what will this do to the price of 2014 SF eagles if they cease production in the next few days or weeks? Anybody notice there are no 2014 silver reverse eagle coin sets this year !!!! They do not make the reverse silver eagle every year, only special times will they do so, now next year is going to be the 30th anniversary year for the silver american eagle, maybe then they may come out with the reverse in a set. We will have to wait and see.